Some sandwiches are best served hot. Well we’ve got one so delicious it’ll never have the chance to cool off. If you’re a fan of turkey, got a thing for asparagus, and the odd hankering for cheddar (who doesn’t?) then this little gem is going to become your next best friend. If, that is, sandwiches can be best friends… sure they can. We said so. Evenly spread 1 tsp. of butter on each bread slice. Flip bread slices over butter side down. Spread Dijon mustard on the top half of bread and sprinkle half of the cheese on the bottom half of bread. Top cheese with turkey, followed by asparagus and remaining cheese. Place remaining slice of bread on top, mustard side facing down. 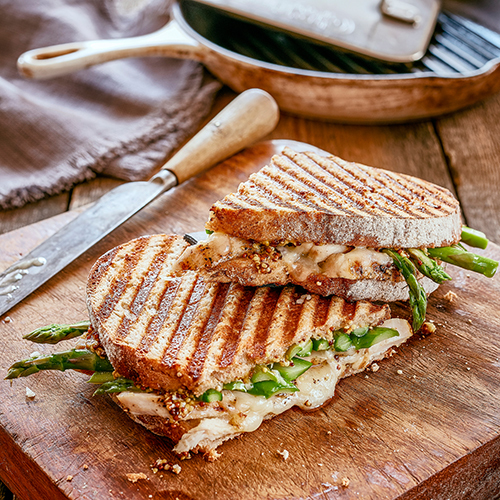 Cook on panini press for 3 minutes or until cheese is melted and bread is toasted. Serve warm. Generously season turkey cutlets on both sides with salt and pepper. Over medium heat, grill cutlets 6 minutes on either side, until no longer pink inside. Remove from heat and let rest 5 minutes. Slice into ¼ inch slices. Tip* Replace grilled turkey with 6 slices of smoked deli turkey. This recipe will taste just as good!